Published on December 31, 2008 in :: family :: and travel. 0 Comments Tags: Half Moon Bay, New Years Eve, NYE, San Jose. We’re hanging out at Yoshi’s parents place right now. Yoshi is playing around online while watching sports in the living room. Yoshi’s dad just finished cooking crabs. Yoshi’s mom is making all kinds of foods for tomorrow’s shogatsu/osechi. (Yes, I’m going to go help in a bit!) I’m working right now to make up some hours from when I went to have a long lunch in Half Moon Bay. Earlier today, we drove out to Half Moon Bay to go pick up thirteen fresh crabs off a boat! (Last year we went and there were no crabs to be found. We ended up having to settle for store-bought crabs.) While we were there, we had lunch at Ketch Joanne Restaurant and Harbor Bar (now a New Years Eve tradition for us). Last year, we spent New Year’s Eve in SF with friends, which was wonderful. We stayed at the Kabuki Hotel in J-town, so they were piping in NHK on the TV. I’m totally disappointed right now because we searched the DirecTV listings here in SJ, and there is no Kohaku to watch! Wah! 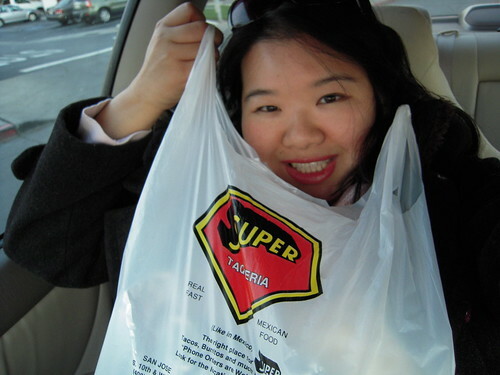 Here’s a picture of me with our take-out Super Taqueria food. 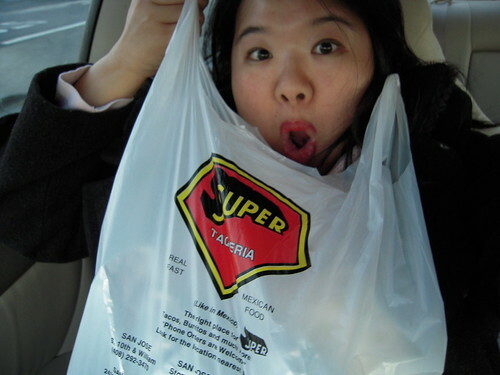 Here’s a picture of me being a freak with our take-out Super Taqueria food. The jozjozjoz.com archives for the half-moon-bay tag.